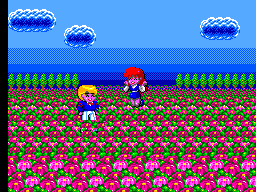 Picture it: You love nothing more than to stand in the middle of a bright pink field of flowers and watch your girlfriend jump up and down like a drugged up simpleton. Sure you've got hayfever, and she hasn't even put out yet, but you love her and will do anything to be with her, although as she jumps up and down in a seemingly infinite loop, while making that squeaky noise, you're starting to wonder why. Then BOOM! From out of nowhere comes some weird little, fuzzy, green, freak who traps her in a bubble and turns you into a filthy, bread munching, oily feathered, water fowl! What are the odds?!? Well I dunno, I’m not a statistician for Geoff’s sake, so let's just get on with the review: Yippeee (note sarcasm) It’s Dyanmite Dux. You begin your surreal adventure stood next to what appears to be the Colonel (of KFC fame) with a horde of mad, bloated-head, puppies closing in on you. Right let's see what this duck can do! You punch the puppies right in their adorable chops, probably breaking their underdeveloped teeth and forcing them into their brains, and move on in similar fashion to some Moose-slugs-efforts. At this point you may note you can fly kick, sort of, and build up your punch into an uppercut by holding the punch button down, but there's no time for that junk here comes your first weapon. Ah the humble rock, being used to crush domes since the days of the caveman. Well it worked for them so let's get launching these into something’s nose! This for me is where the game begins to make more sense, so far all that punching was a flickery, touchy, affair that seemed more trouble than it was worth. So what's next? Well you'll face off against rollerblading Yorkshire Terriers, diseased looking dog things with grenade launchers and weird hoards of mini thingies and sumo pig monsters. No one can say this isn't inventive stuff...well perhaps mentally deranged is more on the money, but it’s definitely something. So what other weapons of doom do you have to fight the plethora of freaks and miscreants that pour forth from the minds of the Sega crew? Well they’re not that bad actually, in the first level alone you'll be hammering rocket launchers, the aforementioned rocks, bombs and even a water pistol will aid you in battling the first fiery mini boss. It's above and beyond the weapons that the game falls flat on it's feathery duff, punching brings on a tidal wave of flicker and the odd collision issue. But then again was this ever going to be a winner? 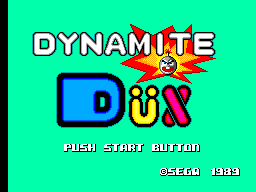 I very much doubt it, Dynamite Dux seemed to be fated to mediocrity from the get go...I can't exactly pinpoint it but it's just...a bit....poo. Let’s look at some of the other elements though to see if they can add a little shine to this cartridge encased turd. The graphics are not hugely terrible, I suppose. The pallet is fully utilized to say the least, from vibrant, retina burning pinks to equally eye thumping luminous greens, yup they're all there, the whole rainbow, but if you haven't already guessed it's all a bit gaudy. Then there's the animation, the characters are strange but fairly well devised and follow the wacky design laid out in the opening sequence very well but, man, that animation is so stiff it verging on morning wood. Two frames are often all that's used for many of the characters and considering they're trying to pull off a full on 'cartoony' look it would make John Kricfalusi puke his hoop up. So the top and bottom of all of these graphical bullet points equals another all too glaring 'mediocre medal' to add to the games already growing collection. Twinkly, horrid, saccharine tunes accompanied by a gamut of pathetic sounds effects that'll pull your gums back and inject cheese directly into your skull. It's almost too much to take onboard. Just turn that rubbish down and treat yourself to some of your favourite tunes - be warned though you may just have to jam on some Cannibal Corpse or something equally nasty just to get the bad taste out of your gob. 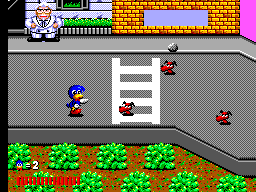 The controls are pretty tight really - they're responsive and enable you to do all that you need to do, the problem comes with the collision detection and your characters generally useless moves set: when he isn't holding a weapon of mass destruction he’s literally a sitting duck. So the controls aren’t bad, but nothing can dodge around the fact that the game was a bad idea from the outset and badly implemented from that point on. If you manage to get through it then you may well play it again one day in the distant, distant, future, but I know I won't entertain it ever again. If you get killed you'll be sent hurtling back an absolute mile at points and, if you can call it such, this adds some sort of cruel replay mechanic, providing you can drag yourself through the sludge one more time. I think you've got more chance of seeing a one legged monkey doing a back flip into a bowl of store brand wheat biscuits while playing Rock you like a hurricane by the Scorpions on a golden fiddle than seeing me play this ever again. A trip into all that is bad and should not be in a scrolling beat 'em up. You want to be controlling someone like Rick from Splatterhouse while he pulls a zombies tongue out the back of its neck, not some deformed quiff-sporting duck-freak hurtling pebbles at puppies. But it goes above and beyond the aesthetic and into the very core of this bad apple. It was a bad idea, pulled off badly, and everyone involved in its conception should be shot out of a cannon into the bog of eternal stench. Don your cloaks of shame Dynamite Dux development team your day of reckoning will soon come.